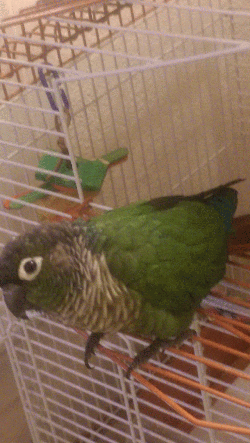 Hi, my name is Snookie and I am so happy to be a Mickaboo bird! My previous human loved me, but he was evicted from his home and couldn`t keep me, so here I am. I get along really well with my new foster dad and he has been teaching me to "step up," especially if there is a good treat involved. I can fly, and I like to land on my foster dad`s head or shoulder and ride around (if he will let me). Although I am still in quarantine, I can hear the other birds in the house and often call to them--they sound friendly, so I am looking forward to meeting them soon. My humans aren`t sure if I`m a boy or girl. Its hard to tell, because boy Greencheeks and girl Greencheeks look alike. If you are looking for a playful, attention-loving bird, I might be just the one for you. Just ask for Snookie!